I’m always a sucker for a bargain, so when Battlefront recently had a 25% sale in preparation for withdrawing some models from sale whilst they re-model, I took full advantage and added another peak to the lead mountain. One gap in my collection that I was happy to fill in were some Jagdpanzer IVs: the infamous very low profile tank hunters. These were easy to build (therapy after the Steyrs!) and easy to paint. Spray dunkelgelb, then use the sponge pad that Battlefront use as packaging to protect their models to dab on some dark green then brown. Wash with the ubiquitous Agrax Earthshade, highlight with Screaming Skull, do the tracks, crewman and decals and away you go. Simple. Can’t wait to get them onto the table. 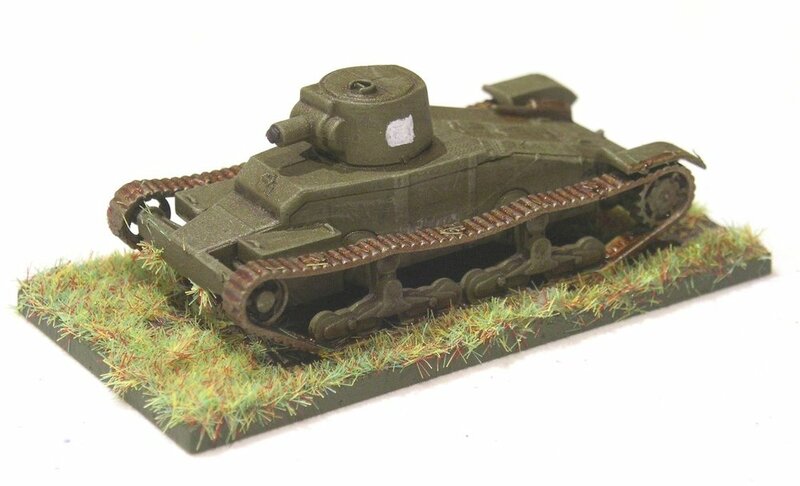 I’m quite a fan of plastic vehicles: the price means you can buy by the company rather than by the platoon, the plastic allows for an incredible amount of detail, and they weigh a fraction of their metal or resin equivalents - important when you’re carrying a company of large tanks around! So when I needed a re-stock of spray paints for undercoating, and had decided to use the ones available on the Plastic Soldier Company website, and noticed that they had released a set of Steyr heavy transport cars, I impulse-purchased a box-full and looked forward to adding them to my collection. I didn’t exactly need them, but they could join the mass of other PSC products that I already had: Cromwells, Churchills, half-tracks etc. As you might have gathered already, I like PSC kit, and have built many a PSC model, but I’m afraid to say that these were a complete nightmare to put together! 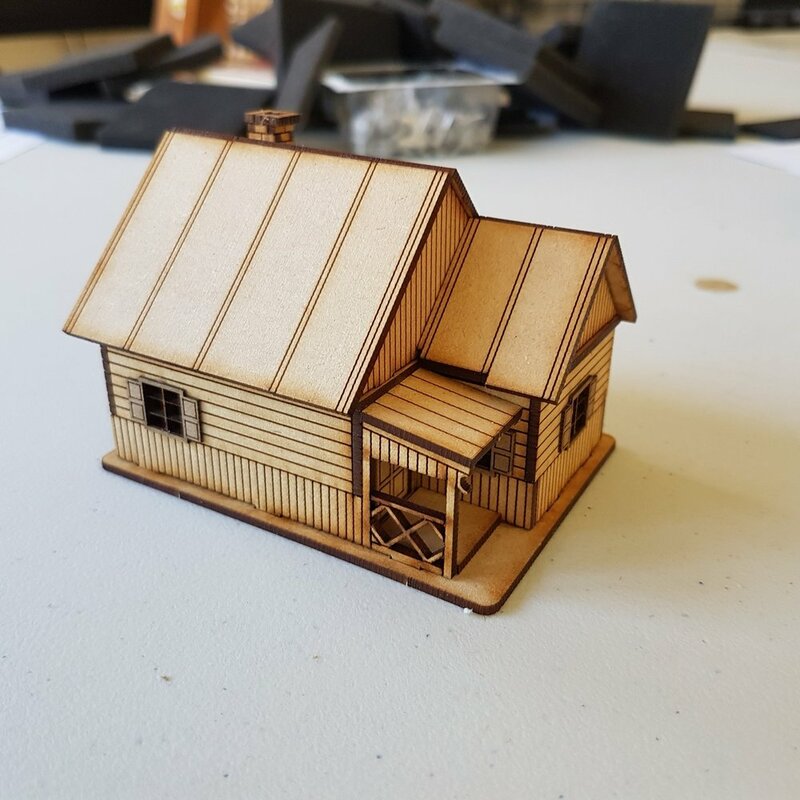 They’ve turned out brilliantly, as you’ll hopefully see from the pictures below, but the actual build process was…well, it was traumatic, to say the least! The problem starts right at the beginning of the build: step 2 in the instructions IIRC. The first step is to attach the bottom of the vehicle to the chassis that will take the wheels. No real problem here, but my advice is to do this on all the vehicles you are building first, then properly leave them to dry until the glue is rock-solid. That assembly is going to take an awful lot of pressure as you try and complete step 2, and will easily un-stick itself as the shear you will have to use takes effect. Okay: now onto step 2. Sticking the sides of the vehicle onto the bottom/chassis assembly. This is where the fun starts. The sides of the vehicle are necessarily shaped and curved to represent the body and the bonnet (hood for my US chums) of the Steyr. This curved piece of plastic is not quite shaped correctly to sit on the vehicle bottom. This means that you have to glue the front of it in place, and then bend the plastic into position on the sides. That means gluing plastic under pressure in place i.e. the sides want to flex back into their natural shape rather than sit in position as the glue hardens. As this is a 15mm model, the surfaces to be stuck together are small, which means there’s not much glue available to hold the plastic-wanting-to-flex-back to-its-natural-shape in place. One simple paragraph, but a couple of hours of extreme frustration! No matter what I did, I couldn’t get the models to go together without leaving seam-gaps where there shouldn’t have been seam gaps. By the end, I was using plastic cement, Superglue, and, finally, a paste made up of Superglue and PVA mixed together in a desperate attempt to make things work. I had so much glue on my fingers that, even now, four days later, I still look like someone trying to conceal their fingerprints from forensics! 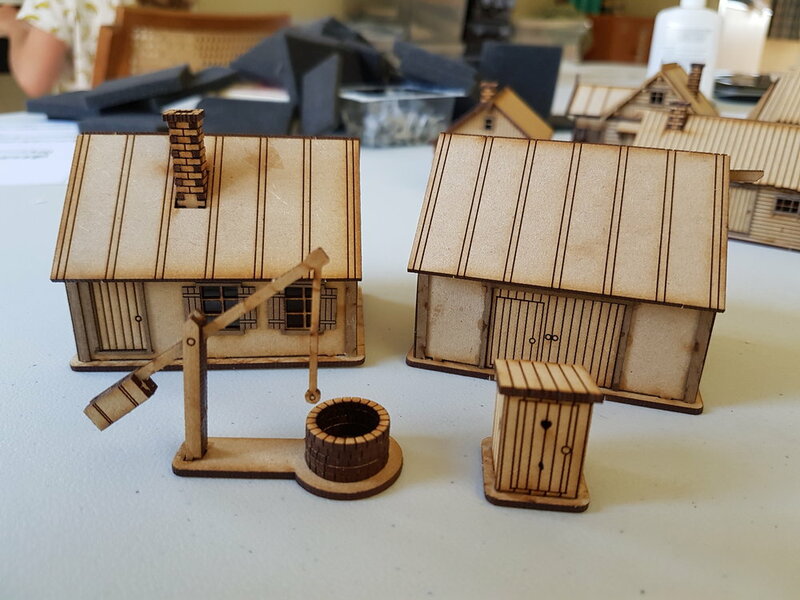 Things got so bad at one stage that I seriously considered taking two of the models outside and using a hammer to smash them into smithereens! I can feel my blood pressure rising even as I type this! 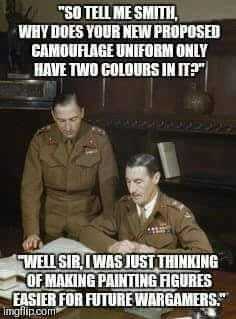 The paint job is simple. Spray dunkelgelb from the PSC spray can. Paint canvas light brown. Wash with Agrax Earthshade, highlight with Screaming Skull. Paint in relevant bits: tyres, tools and the windows. I’m quite pleased with the windows: they are painted a medium-light blue then very gently brushed with a bit of white. So a very lovely looking set of transport vehicles, but achieved with much pain and frustration…to the point where if PSC offered me another box for free, I might actually say “thanks, but no thanks”. PS Note that the Steyrs come with plenty of options: early or late (my bad: the single Steyr shown above is an early model painted in late colours, the only one I actually made that mistake on: the others are all late models painted in late colours); and with the option to have the canvas top down showing the inside and some crew. I would have done that, but was so hacked off with the basic body build that I just wanted to get them finished, so went with the quick slap-on-the-canvas-roof option instead. 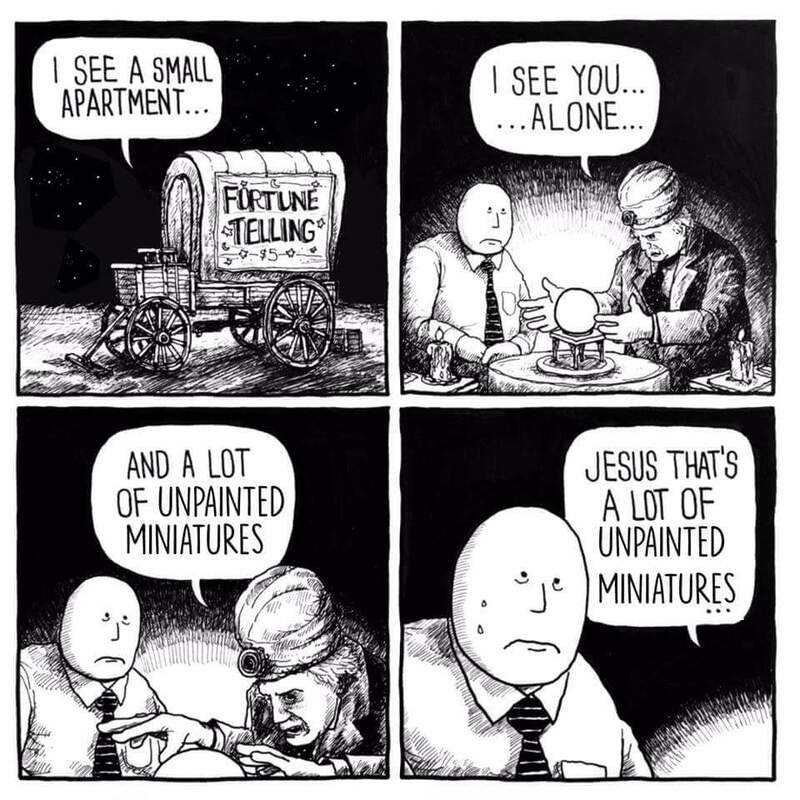 These have been sitting on my painting table for a few months: ever since the TimeCast sale in fact. 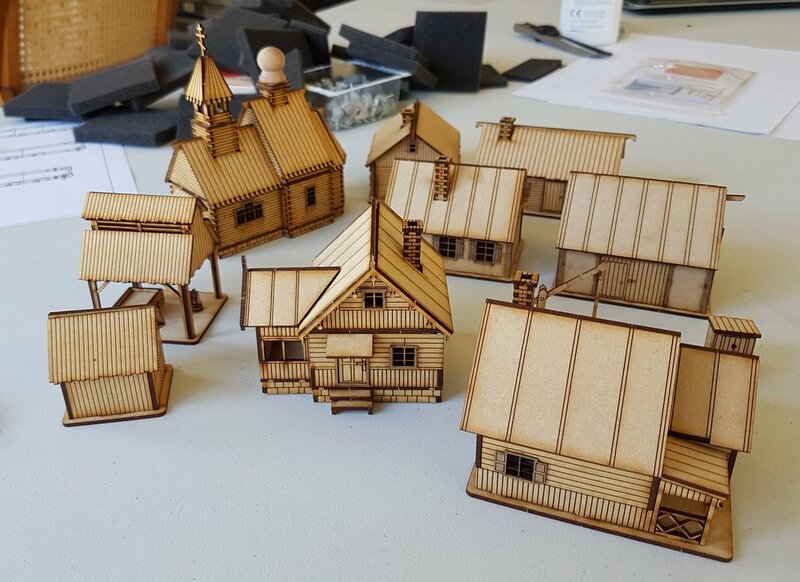 Here we have the Village Church, a Small Barn, and the Village Accessory pack from TimeCast’s 15mm Eastern Europe range. IIRC these are the re-mastered models, and very nice they are too. The resin is smooth and takes the paint well. 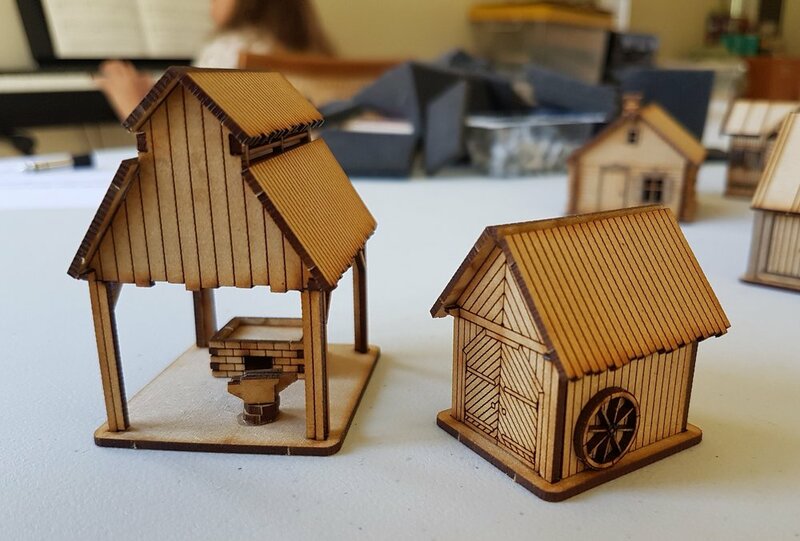 I’d question whether the Barn is small or not, but I like the church and accessory pack very much. 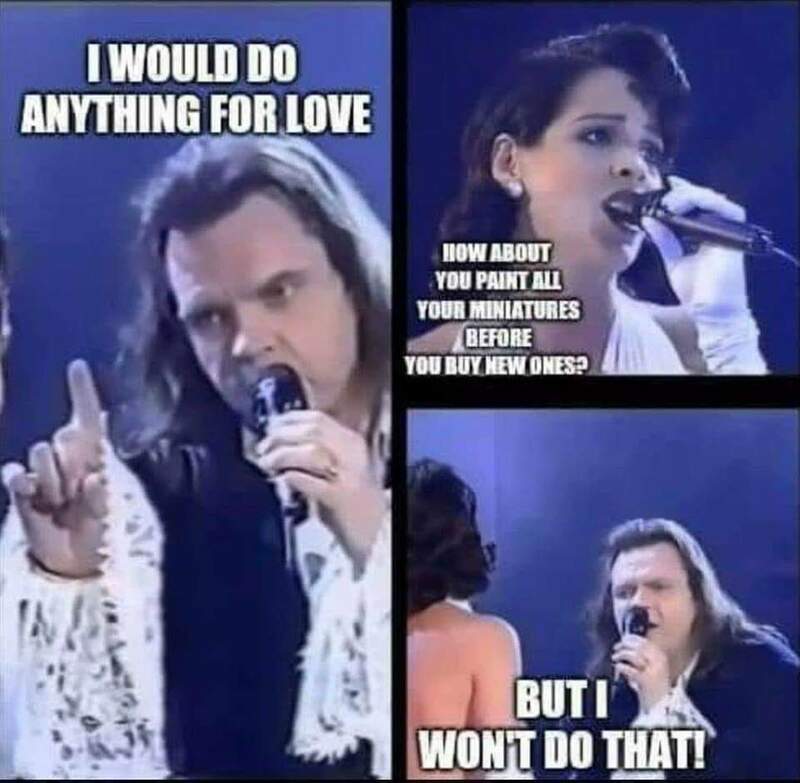 That’s my Painting Challenge started for 2019. Continuing my re-photographing of my collections, next up is the BEF: the British Expeditionary Force of 1940. The album portrays a Regular Infantry Company plus its battalion, brigade and divisional support; plus the various options available for supporting armour. This was actually the very first WW2 army that I painted up, and although the infantry have withstood the test of time (and many appearances on the battlefield), the armour could do with a complete refresh. In my defence, however, when I started this collection many years ago, there weren’t the range of cheap, plastic tanks available that there are now. Were I starting again, I’d be going for a complete company of each type of tank available from Zvezda! The OB for the collection is taken from the second of my Blitzkrieg in the West theatre books for I Ain’t been Shot, Mum! One of the ‘toys’ I got for Christmas was a new digital camera. I’d had the old one for some seventeen years, and it had really started to give up the ghost. Batteries were drained with one shot, it hated anything but the brightest of sunlight, and the cover to the compartment for the batteries had developed the annoying habit of popping open at the slightest touch. The new one came from the post-Christmas sale from John Lewis. This was another first from me, as I actually stood and queued outside for half an hour, and then rushed in with the tsunami of other shoppers to try and get a bargain: not something I have done before, as I usually avoid the whole “Sales” madness. It seems to have been worth it, however, as once I had actually worked out where the sale items were (in their own special area) I picked up the camera I wanted for £30 less than the sale price on Amazon. New camera means an excuse to photograph some figures, so I re-shot all my 1940’s French. Still haven’t got exactly the results I was looking for, but they look a lot better than my previous gallery. You can see the whole lot either here (a rifle infantry company) or here (the motorised version). I’ve got a lot more figures, especially Somua and Char B1 tanks, and some of the more esoteric portee vehicles that Battlefront was pushing during their Blitzkrieg phase, but I’ve tried to avoid cheese and stick to the official OB’s from the TFL Blitzkrieg in the West: the French handbook. Reading the lists and building the gallery is a great way of seeing where the gaps are in my collection. I like a tabletop battlefield uncluttered by intrusive markers, so like to take any opportunity to replace a marker with something that looks more in keeping with the surrounding. 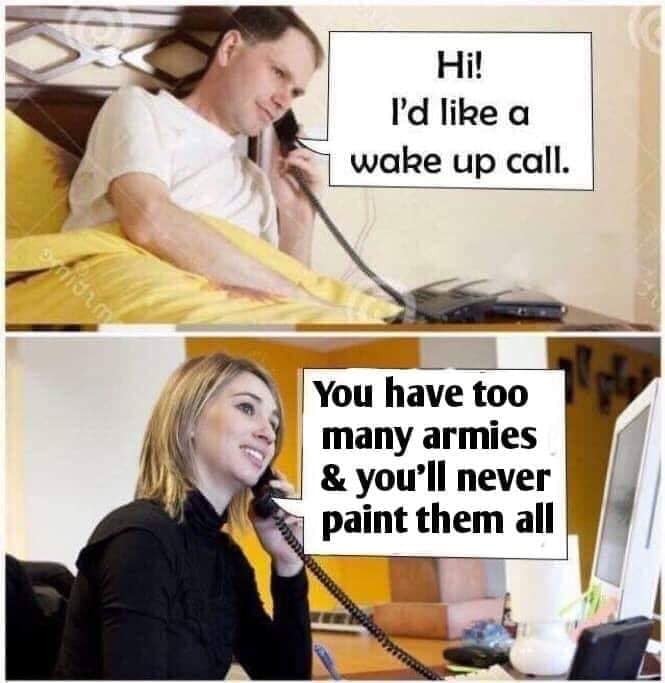 A good example of this is “Bailed Out” markers for tanks: especially useful when playing early war WW2, when you can expect far more bailed out than destroyed tanks. I have the TFL marker pack that has some transparent oval disks with “Bailed Out” on them. I have some FoW markers: circular pieces of plastic in a variety of nice colours with little logos on them. But what I really like is a small group of painted crew figures that can be placed next to the bailed out vehicle in question. I have these for my Germans, Soviets and British, but am mostly playing games set in the September War (Poland 1939) at the moment. Now the Poles don’t have a lot of tanks, but we’re just coming up to the period when those tanks were being used (and lost!) in almost every encounter. Time for me to paint up some Polish tank crews. Battlefront used to be excellent for this. Every tank came with one or two standing crew figures that were designed specifically to represent bailed out and then fleeing crews. As far as I can tell, they don’t do this any more, which is a colossal shame, but I carefully kept all the ones I didn’t use just for a time like this when I needed some. 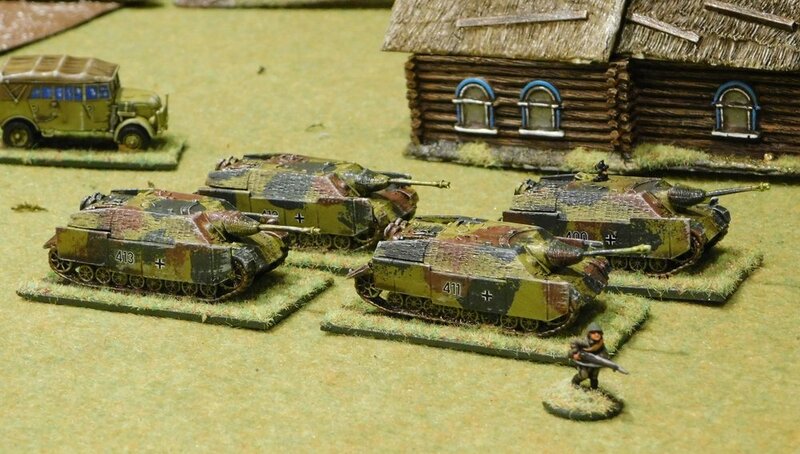 Somewhat ironically considering Poland’s fate in 1939, the above are a combination of Soviet and German tank crewmen painted up to resemble Poles. They are not perfect: the commander’s beret is a bit the wrong shape, and the crewmen should be wearing dark green mini-helmets rather than the padded version worn by the Soviets, but at a range of three feet (and just for a marker!) no-one is going to notice. Although this site is dedicated to the TFL Company Level games such as IABSM, CDS and Q13, I do like to point out what else is going on in Lardland. 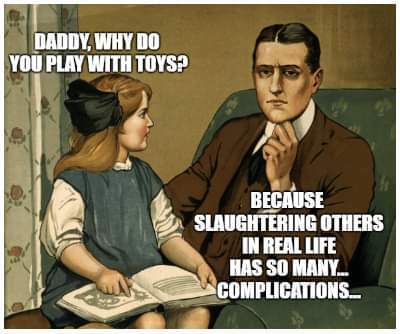 That's why I'm really happy to post that the much-anticipated Early War handbook is now available for the TFL platoon-sized game: Chain of Command. Having published the IABSM early war books earlier this year, I was also somewhat involved in the production of this work, and can therefore assure you that it is truly epic. Rich has gone back to many first hand sources and original army manuals for the information it is based on. Advanced Order Deal: This Handbook will, be published on Monday the 17th of September and despatched on that day. The advanced order deal includes a free PDF edition which will be emailed to you on the release day. This 124 page handbook provides a comprehensive coverage of the campaign in France and the Low Countries in 1940. Included is an historical account of the campaign in the West, as well as whole raft of new rules to cover the events of that summer. New theatre specific rules include Assault boats and river crossings, parachute drops, glider landings, bicycles, horse mounted troops and motorcycles. We have several new armour classifications for tanks with small turrets, vehicles lacking of radios and unreliable vehicles. Fancy blowing up a section of the Maginot Line? Well, you can with our new rules on fortifications and demolitions as well as looking at Francs Tireurs, ‘Shabby Nazi Tricks’ in the form of Brandenburg Commandos, Civilians, Stuka attacks and even the odd drinks cabinet being rolled out to stiffen the stiffest of upper lips. Finally, we have five new scenarios types, Going with a Bang, Strike from Above, Swift to Support, Hasty Defence and Blitzkrieg to bring the 1940 campaigns to life. 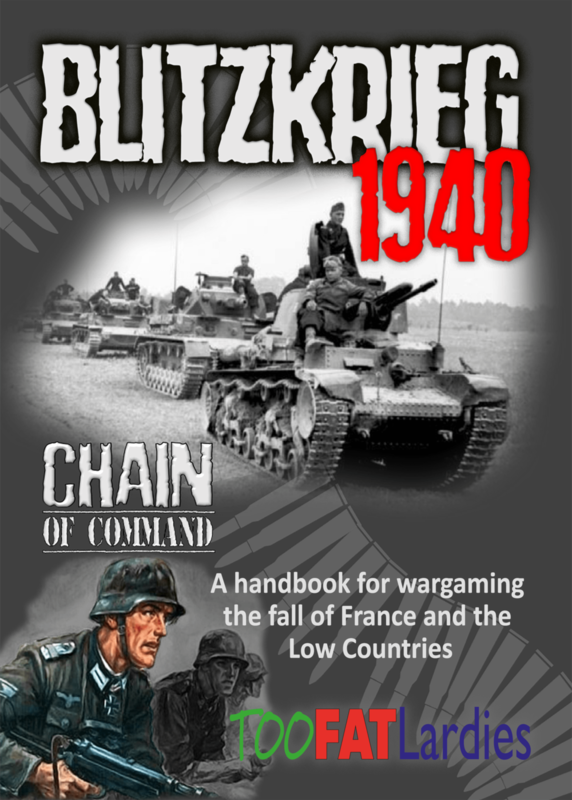 All in all, a huge addition to your Chain of Command library in both hard copy and PDF. Regular visitors will remember my post of a week or so ago mentioning that I had found somewhere (Heer46) that produced a model of an SdKfz 247: the command car used by some of the German armoured car regiments in the battle for France. The two I ordered arrived quite quickly, and immediately jumped to the head of the painting queue. There are two possible variants: one with a canopy over the rear compartment, and one without. Lovely models of an uncommon vehicle that paint up very nicely. Another piece of kit that I can't wait to get onto the tabletop. Those of you who are building an early war armoured car company from a panzer division's reconnaissance battalion (page 63 of the Blitzkrieg in the West: The Germans theatre supplement for IABSM) will have been almost immediately stymied by the need for the Big Man in the Company HQ to ride around in an SdKfz 247, as no one seems to make one. 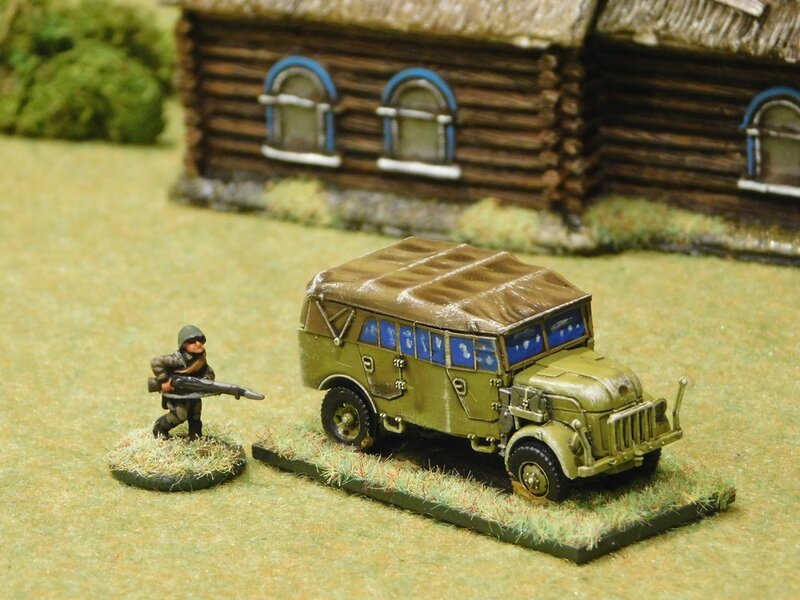 The figure manufacturer Heer46 now have an SdKfz 247 model available in 15mm. It's the Auf. B version with four wheels, as opposed to the Auf. A model with six wheels, and looks like a cracking bit of kit. I've ordered two of the little blighters, even though I'm unlikely to ever need to field more than one. The only problem, by the way, is the cost. In common with anything wargames related from Europe, they cost a comparatively enormous amount. The model is €11.80: which is about £10 or $14! 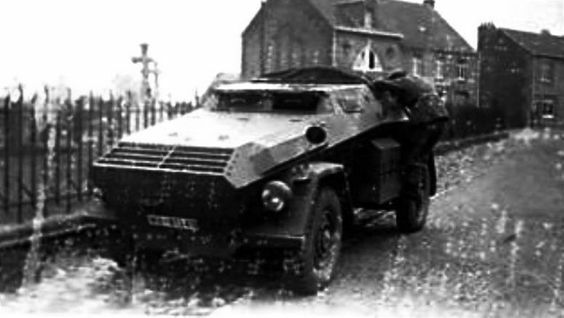 That's about five times what you'd pay for a plastic SdKfz 222, making the SdKfz 247 the Ferrari of the German army! "An awesome piece of work. The level of detail is incredible." "Turned on computer a couple of hours ago. Went to TFL website immediately looking for Blitz-Germany. Only time for a quick scan through: outstanding! "IABSM was my first Lard rules (still a favorite) and all four Blitz books provide the best single sources of information for 1940 I know of. Useful in many ways, thanks for your work." "I have bought the four books and they [are] the best thing since sliced bread. Not a player of IABSM myself but the detail and depth of the information is so good that can be used for any other set of rules or just for reference. Excellent job, congratulations." "I've had a head start on the reading this as I helped Robert with the proofreading and I can say that he's put a huge amount of work into it. I had no idea that German OOBs in 1940 were so varied. 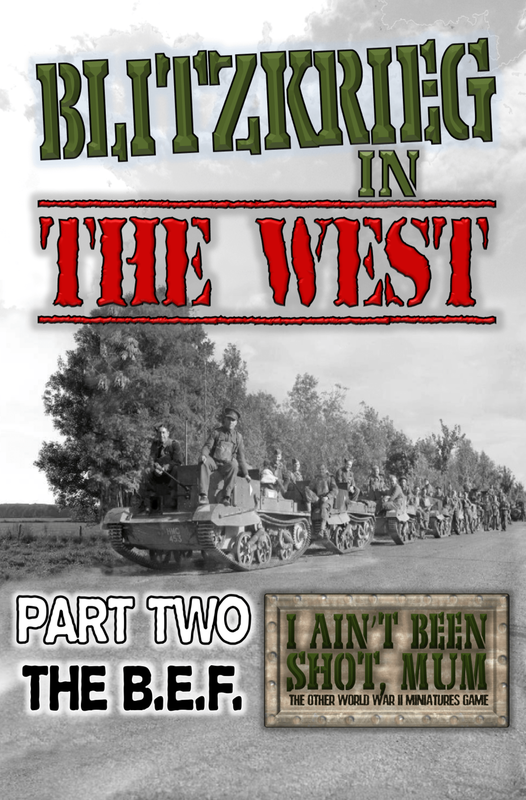 "The whole Blitzkreig in the West series is an absolutely fantastic resource for any wargamer interested in the 1940 campaign. You can use the lists in the pdfs to build OOBs at any level from company to division. 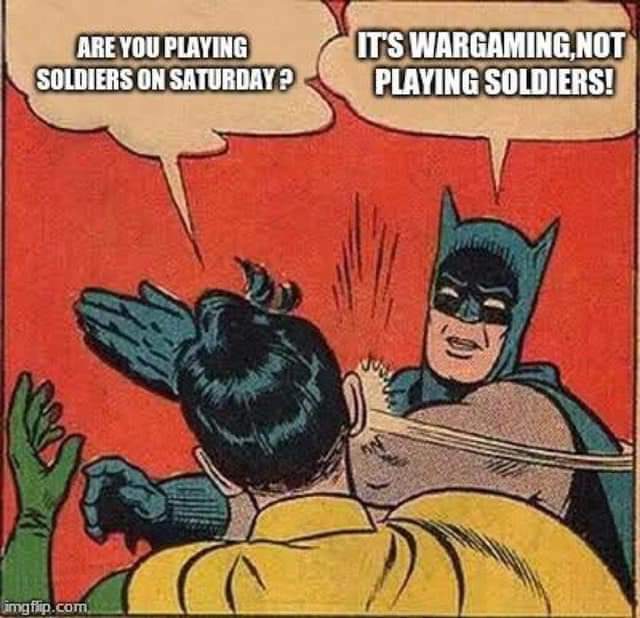 "And the lists are also useful if you're playing a platoon level game such as Chain of Command as they enable you to see exactly where all the various support options come from. This is invaluable if you're trying to build support lists limited to what was historically available to any specific infantry platoon." "More superb work from Mr Avery. Can't recommend it highly enough. Even if you do not game IABSM the unit information is astounding." 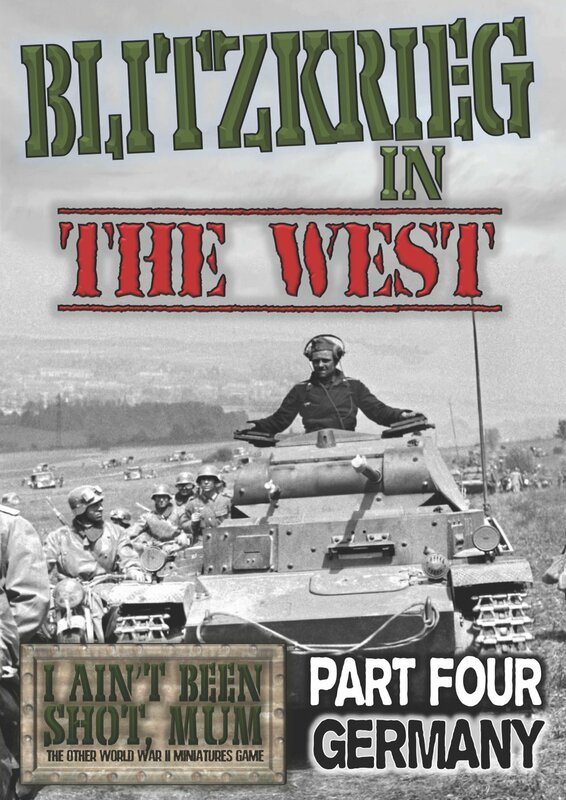 Blitzkrieg in the West: Germany is the fourth in my series of early war handbooks for I Ain’t Been Shot, Mum. The handbook is a massive 185 pages long (over double the size of either the French, BEF or Low Countries books) and covers the whole of the German army that invaded France and the Low Countries on 10th May 1940, seventy-eight years ago today. The book begins with the humble infantry: not one, homogenous, grey-clad mass, but actually eleven different types of infantry division, each with their own set of core and support troops. Next, after a quick look at the infantry that doesn't fit into the above (e.g. the Gebirgsjaeger), the book moves on to the ten panzer divisions: with each panzer division given its own section and set of lists. There are, for example, five different lists that relate to 9th Panzer Division alone. After the Panzertruppen, the book covers the cavalry, the SS and the army level support troops (that's where you'll find the StuGs!) before finishing off with the Fallschirmjaegers and Air Landing troops that dropped into Belgium and the Netherlands. Finally, we have the usual ratings and armoury sections, and a note on air support. Although designed for IABSM, Blitzkrieg in the West: Germany contains a vast amount of information useful to gamers of other systems, and is really a must-buy for anyone interested in the early war period. Available now from the TooFatLardies website, we've kept the price at £8.40: the same as the other three handbooks, despite its much larger pagination. That should make the set of four books - France, the BEF, the Low Countries, Germany - absolutely affordable for all. I took advantage of the bank holiday weekend to finally finish the company of early war Polish tanks that I have been working on. I say a company, but actually I painted twenty-two of the little blighters: sixteen as the single-turret model, and six as the double-turret model. That gives me the flexibility to field a company of tanks from the 1st and 2nd Tank Battalions (all single-turret); most of the 3rd Tank Battalion (one reduced company of single-turret, one reduced company of double-turret); or (given a little bit of leeway in counting 7TPs as the Vickers tank they were based on) the mixed platoons of 12th or 121st Tank Companies. The models are all 15mm from Battlefront via Element Games. Undercoated in Army Painter green, then with the pale yellow and then the brown camouflage on top. The same basic camouflage pattern was used for each tank. Then washed and dry-brushed to bring up the detail. Note that I had another varnish disaster in the initial spray. Not the varnish's fault, on this occasion, but mine. It was very hot, and I didn't shake the can properly, so got a light frosting of propellant/bad varnish. How did I solve it? As I've mentioned before, a light coat of olive oil got rid of the frosting, then another two sprays brought the models down flat again. 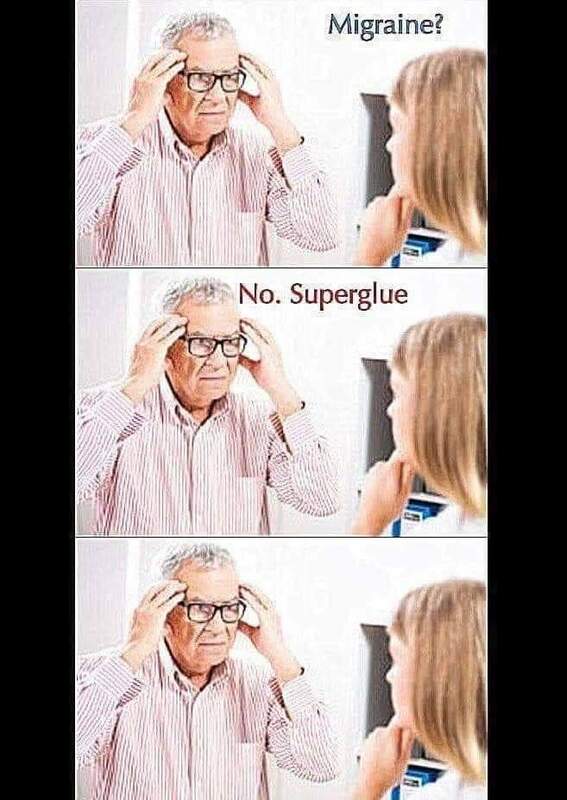 A close call! Just to give my latest handbook for I Ain't Been Shot, Mum a little pre-publicity, I got the cover through from Rich today. The handbook will be available from the TooFatLardies website on May 10th (next Thursday) and weighs in at over 180 pages! The good news is that despite its huge size (over twice as big as the other handbooks in the series) we're not making it more expensive than the other books: it will be the same price as the French, the BEF and the Dutch/Belgians. The handbook will cover the German army that invaded France and the Low Countries in May 1940. It will contain lists for each of the ten different types of infantry division, each of the ten different Panzer Divisions, the cavalry, the SS, the Fallies, the army troops...you name it, it's in there! A few posts ago I mentioned that I had bought a whole company of Polish 7TP tanks, plus six extras for the dw version, from Battlefront via Element Games. It was now time to build the little blighters. The jw single-turret versions are very easy to build: all you have to do is add a commander and hatch to the top of the turret, the gun to the front of the turret, the correct turret base plate to the main body of the tank, and then the tracks to either side. There is, however, one thing to watch out for. There is a spot on the left hand side of the hull, towards the front, where the resin is very thin and very weak. Fully six of the twenty-two models I constructed either came out of the packet with this bit chipped away, or broke there as I glued the left hand track on. Now with the turret on, and after painting, these gaps probably won't be noticeable on the tabletop, but it's enough of a hole to make me think about reaching for the green stuff. Six out of twenty-two tanks broken in this way (about half out of the packet like that, about half caused by me until I realised how careful you need to be) isn't a very good score from Battlefront. In my earlier post, I did mention that building twenty-two of the same type of tank would be a good opportunity to check quality control. You've got the above weak resin spot, but were there any more problems? So if we count half the tanks with the weak spot gone (i.e. blame me for the other half) and add the two shown above, that's five out of twenty-two packs or 22% damaged items. 22% or about one in every five. That's much worse than I was expecting. So, Battlefront, and it gives me no pleasure at all to say this, you have an amazing range of great-looking kits but, given availability of the tank I want, I will always go for Zvezda and/or Plastic Soldier Company before you: not because I particularly like plastic tanks, but because your quality control is so rubbish. Simples. Real life and all the work I have been doing on the IABSM early war handbooks has kept me away from the painting table recently, especially as what currently lurks there is the company of 15mm PSC late war Germans with all their camouflage and bits of kit...so, it was a relief to actually sit down and paint something else. 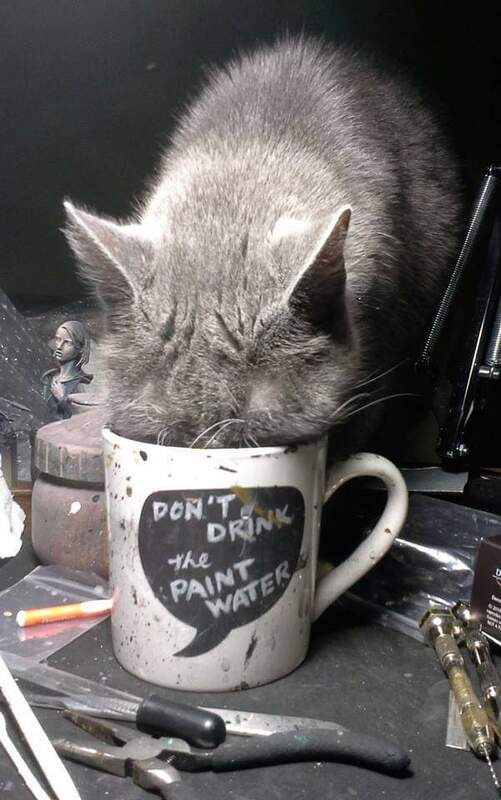 What did I paint, I hear you ask? A company of this? 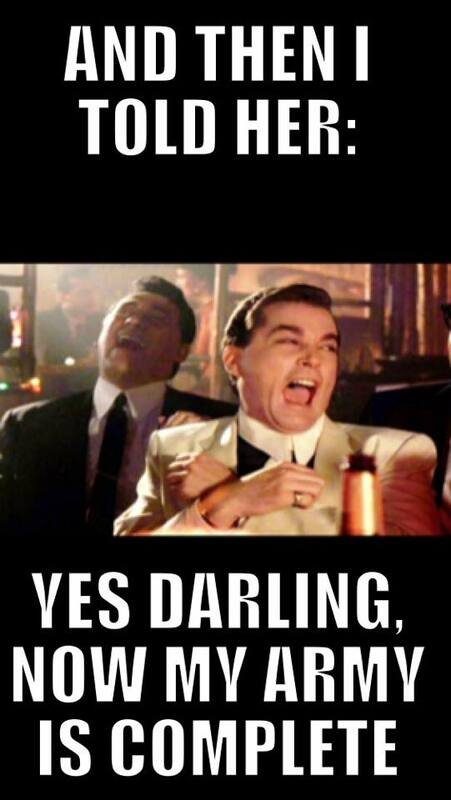 A company of that? Regrettably not: I managed one 15mm tank! I was reading the IABSM BEF handbook and realised that I only had two Matilda I's painted and ready to go and, as all those of you who have kindly purchased the handbook will know, they came in troops of three tanks. I did, however, have a Zvezda Matilda I in the lead mountain. Not sure why...but I think it might have been an impulse purchase using up the last few pennies at Warfare last year rather than anything considered. Anyway, I had one and I needed one, so built and painted it in a couple of hours. The kit snaps together in about twenty seconds and, as you can see, paints up to be perfectly serviceable for the wargames table. I paid £1.95 for it, so very cost-effective for a tank that won't get used very often. How does it compare to the Battlefront version? Well, it's slightly smaller, particularly in the delicacy of the tracks, but not enough to make a difference at a distance of 3ft or so. I am quite a fan of the Zvezda models. They are a great way of affordably fielding large numbers of tanks. Recommended.